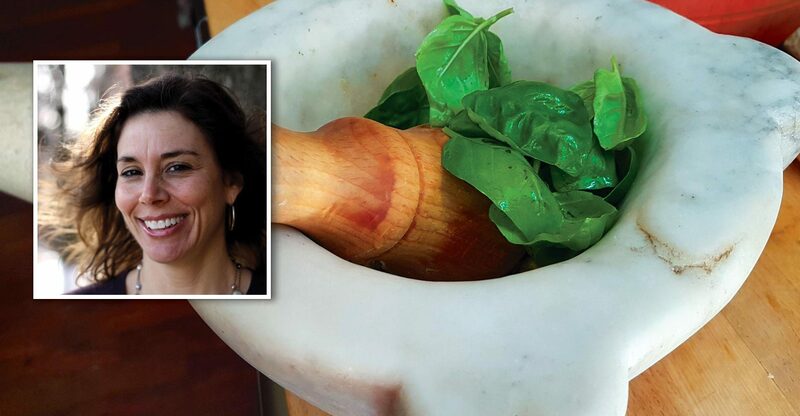 Join Domenica Marchetti, Italian-American food journalist and author of seven books on Italian home cooking for an exclusive tour to discover the Italian Riviera and its culinary traditions. 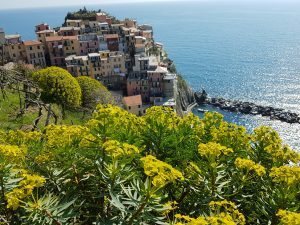 Visit Cinque Terre, Portofino and Genoa. Meet local producers, discover old food markets and enjoy special cooking classes. Arrival in Genoa and transfer to your elegant 4* hotel in the city center. Time to relax. Riche welcome aperitif at the hotel. Today you’ll enjoy a walking tour of the historical center of Genoa discovering the town and its ancient food shops! Wandering through the “Carrugi” alleys is a unique experience and we believe that by just walking through these maze of historical streets, you’ll find the “real” Genoa essence. Together with your private guide you’ll discover most authentic and genuine side of the town. Here traditions are still alive and you will find ultra-centenarian food shops: the old “friggitorie” serving friscieu (fried croquettes filled with herbs), farinata, fried fresh seafood eaten at the counter or to take away, the prestigious old pastry cafè where the famous composer Giuseppe Verdi loved to spend his time tasting the pastries , the 200 years old “Pietro Romanengo fu Stefano”. During the tour you will stop for a delicious Panera tasting to try a very special Genoese icecream. For lunch you will be welcomed in a gorgeous Renaissance palace by our Ligurian culinary expert, Mario. You will learn one of the most traditional and ancient recipes of the Genoese cuisine, the Capponmagro, a special dish made with fish and vegetables. Originally it was a simple recipe for fishermen to eat on their boats but now it became a very rich and appreciated dish. In the afternoon you will have time at your disposal to do some shopping or relax. This evening you will taste the best traditional Ligurian cuisine in a typical Osteria Chez Roberto, the king of Pesto. Buongiorno! Take your time to have breakfast and start feeling the Italian Dolce Vita. Our private driver then will wait you to transfer to Portofino! Today you’ll have a relaxing day discovering the picturesque villages in the heart of Portofino Natural Park. The tour starts in the picturesque village of Santa Margherita Ligure, once called the “salotto” of the entire Gulf with its trompe l’oeil painted palaces, it will fascinate you. You’ll live “la dolce vita” walking among charming villas surrounded by elegant gardens and parks. From Santa Margherita you’ll reach Portofino with a panoramic trip by public boat (weather and sea conditions permitting; otherwise you’ll take the public bus). Portofino is a small fishing village which is now the center of élite tourism. You’ll visit the tiny village with its spectacular castle, the church perched on the cliff and the luxury boutiques. But today you’ll discover the wild and most secret side of Portofino. 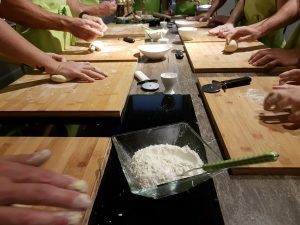 You’ll reach an old mill immersed in the wood of Portofino Natural Park and here learn to prepare Pesto and the traditional Corzetti pasta. After lunch you’ll be welcomed by a local producer to visit an eco farm born from the recovery of abandoned lands with the aim to develop sustainable agricolture and sustainable tourism. The view will leave you speachless: gardens perched on the rocks between sea and sky. You will have a private guided tour of the hops area, visit the bees’ wood, the vineyard, the olive grove and taste local products. In the late afternoon you will go back to Genoa by private transfer and have a special focaccia tasting dinner where you will taste the famous Cheese Focaccia from Recco. Good morning! After breakfast you will meet your local guide and depart with private driver for a tour of the medieval villages of Finalborgo and Noli (about 1,30 hours from Genoa) to discover this secret side of the Italian Riviera, rich in fortified hamlets, gardens and beaches. The day starts with the visit of a chinotto (citrus) grove and tasting: our insider will bring you to discover one of the most rare and precious citrus found in nature, the Chinotto. A bitter orange that grows just in this area of the Italian Riviera and was used in past by sailors for its rich vitamin contents. It is under the wings of the Slow Food Presidia and few producers in the area transform it in delicious jam, candied and liquors, following ancient recipes. The producer Roberto will show you his citrus grove, garden and you’ll hear about his family story and taste its products made in his small laboratory thanks to the expert hands of his wife and daughter in law. The day will continue with a stroll in the amazing fortified village of Finalborgo where you will have lunch in a lovely restaurant of the historical center. Then you will reach Noli, a gorgeour medieval village still surrounded by walls, facing a beautiful beach. In the late afternoon you will go back to Genoa and have dinner on your own with our suggestions. Meals included: breakfast, tasting at the Chinotto plantation, lunch. Today you will leave the city and head over the countryside but always by the sea, you are in the Italian Riviera! Along the way, you will spend the morning discovering the authentic and lively coastal town of Chiavari. You will do a walking tour of the town and its old shops. Chiavari is an underestimated, very authentic small town in the Portofino Gulf. You will visit the old town centre. This village is characterized by its famous narrow arcaded streets called “Carruggi”, which are lined with elegant and exclusive old shops as the pasticceria. Here you will see some ancient local artisan’s workshop such as the one who still continues a very old tradition: he makes by hand the wooden stamps used to produce the typical local pasta shapes known as Corzetti. You will have lunch in a traditional trattoria with a large wood hoven where they prepare the typical Farinata. Then you will continue to Levanto, a lively coastal village, with painted villas and a beautiful sandy beach, just a few minutes from the famous Cinque Terre villages. Check in at the beautiful Agriturismo Villanova and time to relax. In the evening you will gather under the pergola on the beautiful terrace of the agriturismo to have a light wellcome dinner. Be ready to enjoy a full day in Cinque Terre, a private driver will bring you to Levanto train station and there you will take a train to start an authentic tour of the Cinque Terre villages: five small colorfull fishing villages carved out of the rocky hillsides above the Mediterranean Sea! Connected only by paths, boats or trains these lands have not changed their traditional architecture and are as they were in past times. We’ll enjoy an experience through this area and its people visiting the villages let’s say in an insider way (weather permitting, you will take also public boat to enjoy the view of the villages from the sea). You will have lunch in a very nice restaurant and, in the afternoon, you’ll be welcomed by a local wine producer and visit his steep panoramic vineyards overlooking the sea. 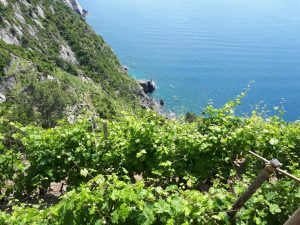 You’ll learn about the heroic Cinque Terre wine still produced by hand and listen to his family story. Then you’ll visit his cellar carved in the rock and taste his delicious wines among which the precious Sciacchetrà, a dessert wine produced in very small quantity. In the late afternoon you will go back to Levanto by train. Tonight you will have a fish dinner in a very good restaurant in Levanto. Today you will have the day at disposal to relax in the quiet garden of the agriturismo, take a stroll in Levanto, enjoy the beach or explore more on your own. Booking for this trip is closed, check our private trip “Italian Riviera Culinary Tour” with departures on demand. 4 nights accommodation in an elegant 4* hotel in Genoa city center. Breakfast included. 3 nights accommodation in a charming agriturismo in Levanto. Breakfast included. Price for this trip is Euro 4100 per person. Ask for more information, fill the form below.